It's hard to listen and translate "Praying" in isolation from that protracted and public legal battle with her former mentor, though its tone is both one of pardon and excision. Kesha says that "recording New Album Was 'Way to Cope' With Depression." Kesha returned Thursday with “Praying,” the first single from Rainbow, her first album in five years. It’s a single co-written with Ryan Lewis, Australian solo artist Ben Abraham and Andrew Joslyn (who also contributed to Macklemore and Ryan Lewis’ The Heist). A wide array of other artists contributed to the record, including Eagles Of Death Metal, Ben Folds, Dolly Parton and producer Ricky Reed. The single comes after Kesha spent nearly three years fighting a public battle with Lukasz Gottwald, better known as the producer Dr. Luke (also known for working on Miley Cyrus’ “Wrecking Ball”), over accusations of sexual misconduct and the “suffocating” control over her career she claimed he wielded after she signed a recording contract with Luke’s company Kasz Money Inc. (KMI) in 2005. Kesha’s claims against the producer were rejected by a New York judge and are currently on appeal. But in April, it was revealed that Sony Music and Kemosabe Records, the label arm of Luke’s music businesses — under which Kesha’s Rainbow will be released — were in negotiations over the future of the label, and that Luke was no longer acting as CEO of the company. In a phone call Thursday morning, a Sony representative confirmed to NPR Music that Dr. Luke is not the CEO of Kemosabe, but that it “still has a relationship” with him. 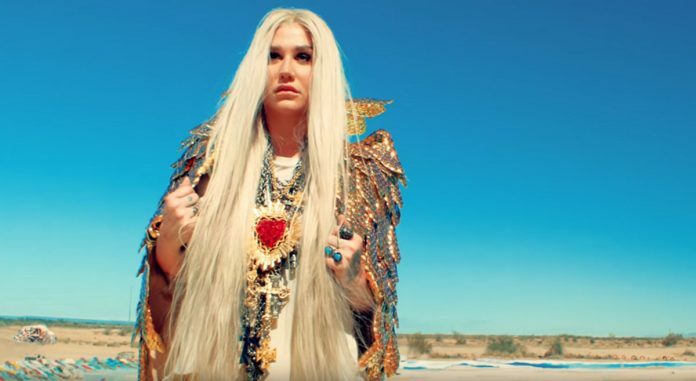 The release of “Praying” this morning leaves unclear the structure of Kesha’s deal with KMI, which was under license to Kemosabe — and, by extension, Sony Music. Luke’s stock on the charts has dipped in recent years, according to Billboard, which wrote in April that Kemosabe last placed a song on its singles chart in 2015. Kesha was its most successful artist. The song’s video, directed by Jonas Åkerlund, looks to have been shot in part within the Salvation Mountain art installation. It shows a contemplative, melancholy Kesha wandering amid the rolling, painted hills of the installation, kneeling down to prayer, and running through the sands with a liberative flag trailing. Kesha releases ‘Praying’ from her rainbow album. “Praying,” the first single from her first album in five years. Watch the video showing a melancholy Kesha.